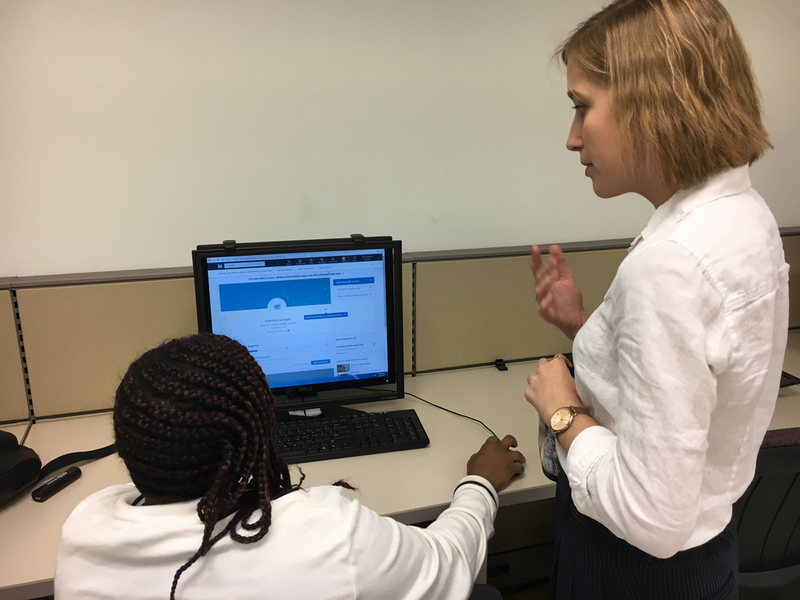 One of our Bronx fellows, Kate, assisting an America Works client with the creation of their own LinkedIn profile during one of our Career Exploration Workshops. Now more than three months into their service year, our Bronx Fellows have been diligently working in a variety of ways to help lift our clients out of poverty and direct them towards meaningful and sustainable employment. As trainers, our two Bronx Fellows Kate and Rachel spend a great deal of time catering to the clients’ needs by facilitating many of the classes that are provided within the America Works Bronx office. Specifically, over the past six weeks, Kate and Rachel have both had the chance to work with clients who are determined to earn their high school equivalency (HSE) diploma. Throughout this Pre-HSE course, Kate has had the opportunity to instruct this cohort of clients through the Social Studies and Reading/Language Arts content, while Rachel has led them through the Writing and Science lessons of the course. As their time with this first six-week Pre-HSE came to a close, Kate and Rachel continued to do whatever they could to sufficiently give their clients the proper knowledge and skills they will need to finally earn their high school equivalency diploma. Kate and Rachel have greatly valued the opportunity to help the clients work towards such a meaningful and important milestone in their lives and are looking forward to working with the new cohort of Pre-HSE clients over the next six weeks. Along with the Pre-HSE course, Kate and Rachel regularly instruct Employment Skills Workshops, which are offered on a daily basis in the Bronx office. This course allows the fellows to explore a variety of job-related skills with the clients, such as public speaking, conflict resolution, networking, and interview preparation. Our Fellows often assist clients in this course by workshopping cover letters, resumes, and any other documents that are critical to master for the job-search process. It has been a wonderfully rewarding experience for the Fellows to work with clients on a daily basis and watch them improve these skills as they move further along the path towards employment. The Bronx Fellows have had the opportunity to work on a new and exciting education initiative, called the Career Exploration Workshops. The purpose of these workshops is to provide clients with opportunities to explore and plan career paths they may be interested in pursuing. These dynamic and hands-on workshops educate clients about the necessary training or education required to move into a specific career, the typical working conditions, salary details, employment outlook, and any other critical information needed to make important career decisions. Industries that have been covered so far include Startups, Healthcare, Financial Services, Accounting, Education, and Social Work. Kate and Rachel are excited to continue working through these workshops with clients and the Bronx education team in order to help determine the best possible career paths for clients’ individual needs. In addition to their education and training responsibilities, Kate and Rachel have begun their policy research efforts focused on innovations in workforce development and lifting individuals out of poverty. Rachel will be conducting her year-long research project on the relationship between food insecurity, health, and workforce participation within underserved neighborhoods. Kate’s research explores the efficacy of different types of financial literacy education and services in improving financial access and stability among low-income populations. The two Fellows are eager to continue working on their projects in collaboration with the other Fellows, clients, and their policy advisors, and are determined to utilize their work to help alleviate the effects of urban poverty. Finally, our Bronx Fellows have greatly enjoyed all of the additional opportunities they have had to work directly with our clients and help them achieve their goals. Kate and Rachel have already learned so much during the beginning stages of their service year experience and they are only looking forward to what’s to come.